Are you signing an agreement with a foreign company? Then you will need a very special type of translation: a sworn translation. In this specialised field of translation, certain texts which have (or may come to have) legal effects with an official body, are translated into another language. This type of translation can only be performed by a sworn translator UK. Many texts require this kind of translation: contracts, business agreements, wills, fines, notary deeds, academic certificates, official claims, etc. A perfect sworn translator ascertains that the content of the original document has been accurately translated in its entirety into another language, and legally certify this by means of its signature and stamp. 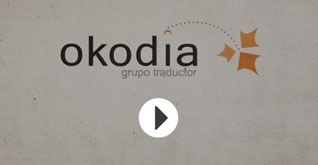 Sworn translation is one of the special services offered by Okodia – Grupo Traductor, in which only official specialised translators can provide and sign. Not all translators can perform these translations (a sworn translator UK is required), and requirements are different depending on the country where the documents are to be submitted. In Spain and for the Spanish language, a sworn translator must have an official certificate issued by the Spanish Ministry for Foreign Affairs and Cooperation. This certificate establishes that the translator is legally qualified to perform translations from a foreign language into Spanish and vice versa. Moreover, it is important to know that the translator who signs a sworn translation must have sound theoretical and practical knowledge that enables him or her to understand and interpret each and every one of the points in the document to be translated. As you well know, in business a mere conceptual mistake or the wrong idiomatic expression can change the meaning of a document. For this reason, a sworn translator must also be an expert in the topic. We also provide sworn translation services for the other official languages in Spain: Catalan, Galician and Basque. For these languages, our translators are certified by the Directorate General for Linguistic Policy of the Catalan Regional Government, the Secretariat General for Linguistic Policy of the Galician Regional Government and the Culture Department of the Basque Regional Government. If you need to translate an official document so that it will be valid in a country other than Spain, please contact us with no commitment and we will tell you about the requirements for that country. In this specialised field of translation, certain texts which have (or may come to have) legal effects with an official body, are translated into another language. This type of translation can only be performed by a sworn translator. Many texts require this kind of translation: contracts, business agreements, wills, fines, notary deeds, academic certificates, official claims, etc. Sworn translators ascertain that the content of the original document has been accurately translated in its entirety into another language, and legally certify this by means of their signature and stamp. Not all translators can perform these translations (a sworn translator is required), and requirements are different depending on the country where the documents are to be submitted. In Spain and for the Spanish language, a sworn translator must have an official certificate issued by the Spanish Ministry for Foreign Affairs and Cooperation. This certificate establishes that the translator is legally qualified to perform translations from a foreign language into Spanish and vice versa. “I have used Okodia’s services several times (sworn translators and an interpreter) and the results were highly satisfactory. They are professional, helpful and friendly. They always found the best answer to my requests. At first I was sceptical because I had never needed a translation service, but now I fully trust them. I will continue to work with them”. We make a team of qualified official sworn translators available who can perform translations in more than 40 different languages. Our team includes official translators from different countries, so we can provide sworn translations for practically the entire world. If your company needs several on-time translations every month (law firms, employment or fiscal advisory services, internationalisation companies, etc. ), we can offer you a solution suited to your needs. If your company only needs one sworn translation, we will offer you a personalised, fair and competitive price. We also offer quick, affordable solutions to meet the needs of private individuals who need precise translations at a given time. No project is too small for us. You have a need, we have a solution. Clear and simple. In business processes, your time is money. For this reason, we adapt to your work schedule and delivery deadlines. To make the most of your budget and work schedule, our team of sworn translator UK work on your project from the start, from the first draft. In this way, they can familiarise themselves with the terms of the future agreement and reduce later time for understanding and queries. To deliver these jobs, we work with the main national and international courier companies – reliable companies that guarantee the quality of service and timely delivery. Your business documents are confidential. Straight away. No small print. For us, confidentiality is our duty, and that’s why we can guarantee that the secrecy of our work will be preserved by signing a confidentiality agreement. That’s your guarantee. Made a decision already? Don’t wait any longer. We translate as clearly as we speak.